A signing ceremony for SportAccord 2006 will be held in Seoul, Korea, on July 18, 2005, which will be followed by a press conference, WTF (World Taekwondo Federation) announced recently. A WTF spokesman said that the signing ceremony and press conference will be held on the fifth floor of the Ministry of Culture and Tourism. The host city agreement will be signed between Hein Verbruggen, chairman of SportAccord, Chung Dong-chea, minister of culture and tourism, and Chungwon Choue, president of the World Taekwondo Federation. 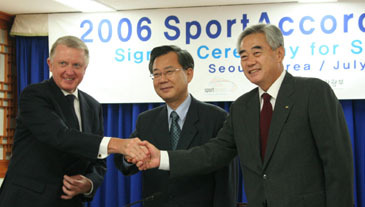 The city of Seoul was chosen as the venue for SportAccord 2006 at the 2005 SportAccord held in Berlin, Germany, on April 20, 2005. SportAccord 2006 is scheduled to take place in Seoul from April 3 to 7 next year, and is expected to draw about 1,200 to 1,500 participants from around the world. The Seoul event could be the largest international sports convention as the general assembly of the Association of National Olympic Committees (ANOC) is scheduled to be held from March 31 to April 5 next year in Seoul. 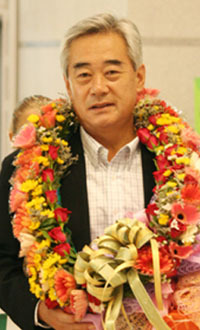 Chungwon Choue, president of the World Taekwondo Federation, poses for the camera at the Incheon International Airport July 14, 2005. SportAccord is one of the largest and most important yearly gathering of international sports leaders and decision-makers in the world. The international sports convention brings together representatives from the 100 international sports federations affiliated to the General Association of International Sports Federations (GAISF), the Association of Summer Olympic International Federations (ASOIF), and the Association of the International Olympic Winter Sports Federations (AIOWF), as well as the International Olympic Committee (IOC) Executive Board, together with sponsors, architects, sports lawyers, broadcasters and other specialists to discuss the key issues facing the sports industry. The inaugural SportAccord was held in Madrid, Spain, in 2003, while the 2004 SportAccord took place in Lausanne, Switzerland.